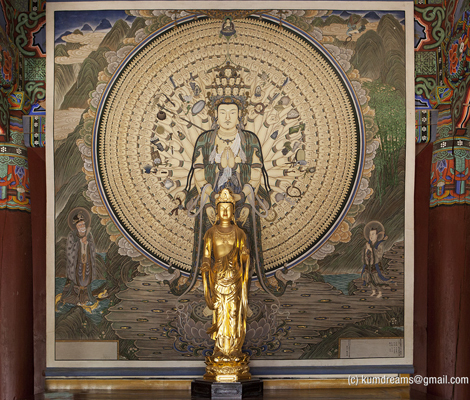 This hall enshrines Gwanseeum Bosal, the Bodhisattva of Perfect Compassion. Also known as the Hearer of Cries, Avalokitesvara's Bodhisattva is dedicated to the welfare of all living things and is ever ready to help those who cry out in their suffering. The original statue dated from 922 and was made of Candana. However at some future date it disappeared but no-one knows when the present statue dates from 1973 when Bulguksa was restored. 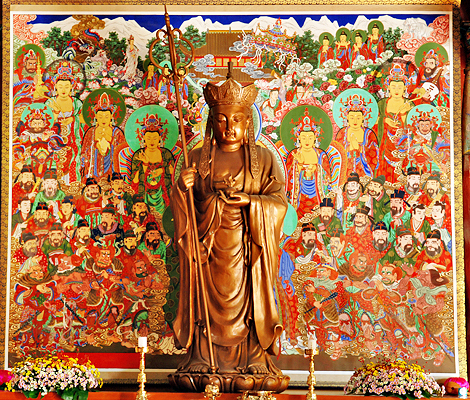 Amitabha Buddha, the Buddha of Cosmic Light who resides in the Pure Land, is enshrined in this hall. This statue, covered in gold leaf and gold powder, is National Treasure No.27 and it was created in the middle of 8th century during the Unified Silla Period(668~935) The 177cm high statue probably had a halo originally. The building was constructed in 750 but burned down in 1593, reconstructed in 1750, and repaired in 1925. As you pass from the Daeungjeon to the Geungnakjeon, you climb 16 steps which have been constructed in three sets. These 48 steps represent the 48 vows of Amitabha Buddha who always prays to help all beings. Place where the Buddha's disciples are. As there are 16 disciples, it is called 16 Nahanjeon or 16 Eungjinjeon. This hall called the No-Word/Non-Lecturing Hall. This is because, even though it is used for lecturing on the sutras, the essence of the Buddha's teachings is beyond language, and thus cannot be lectured. Thus the title bears witness to the limits of language as for as under standing life and the world are concerned. Great Master Euisang(620~660) taught here. Burned down in 1693 during the Japanese Invasion, it was once more destroyed in 1910 and only rebuilt in 1973 in its original form. 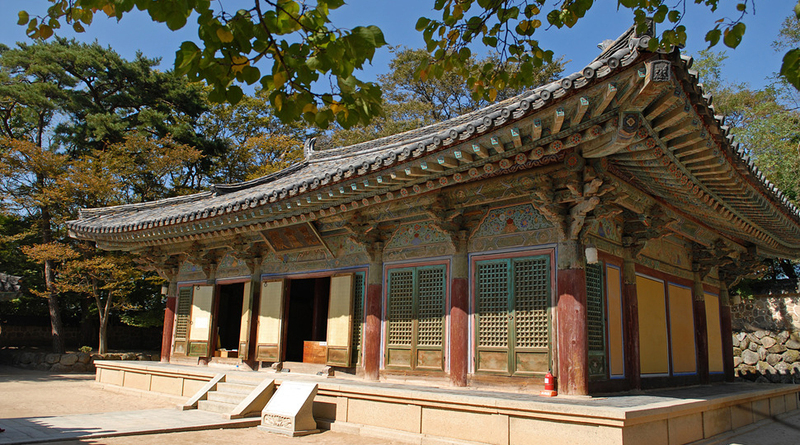 It has a gabled roof and follows the typical pattern of construction the middle of the Joseon Dynasty. 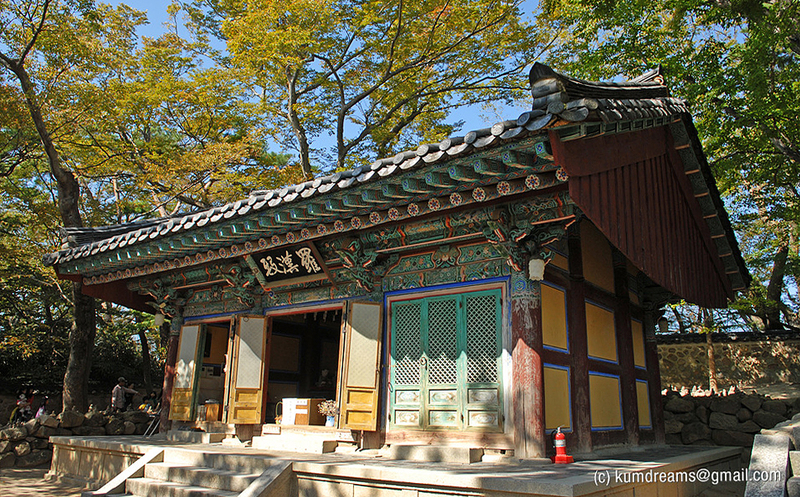 Beomyeongru' is the name of the Bell Pavilion. This literally means "in the shadow of the bell", implying that the sound of the bell spreads, live shadow, all over the world teaching and liberating anyone who wishes to be free from suffering. One of the original buildings constructed by Kim Daesung in 751, it was burned down in 1593 during the Japanese Invasion and then reconstructed in 1612 and again 1688 on the original site. The architecture shows a multi-bracketed structure with a hipped-and-gabled roof. Beomjong is rung to spread teachings of among the ordinary people and to the suffering spirits in the hell All of these musical instruments are used for the Buddhist service twice every day, in the morning to wake up all the living things in the world and in the evening to close the gate to their heaven. 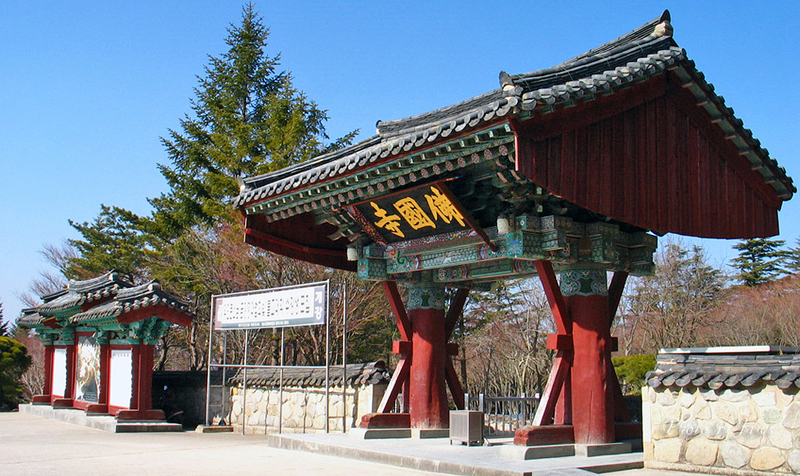 Bulgukgangwon, a sutra school(Buddhist academy) is a modern educational institute for Buddhist monks founded and governed by the Bulguksa temple. Since the opening of the school in the early 1970s by the zen master Wolsan, many Buddhist disciples were graduated and it has acquired a high profile as a specialized formal educational institute for Buddhist monks. It is known that meditating monks hold intensive summer and winter retreat here from the 16th day of the fourth lunar month to the 15th day of the seventh lunar month and from the 16th day of the tenth month to the 15th day of the first lunar month. All monastics follow very strict rules and a rigorous practice schedule during summer and winter retreats, each of which lasts three. The Non-duality Gate: Other names for this gate is the Enlightenment Gate, or Nirvana Gate. "One who sees the law of non-duality will see the Buddha and attain enlightenment," the sutra says. 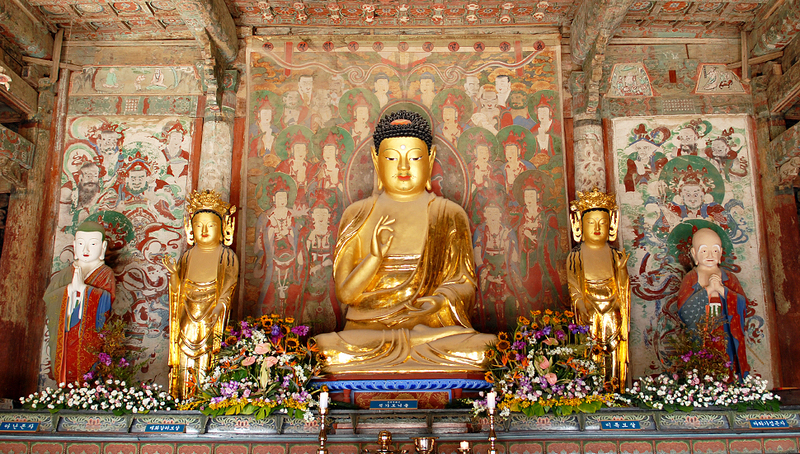 Vairocana Buddha, enshrined in this hall, is the embodiment of Truth and Wisdom and of Cosmic Power. The statue has been richly covered in gold leaf and gold powder; it is National Treasure No.26. Standing 177cm high, the statue probably originally had a halo. The building was constructed in 751, burnt down in 1593(Japanese pirate invaders) and again built in 1666. 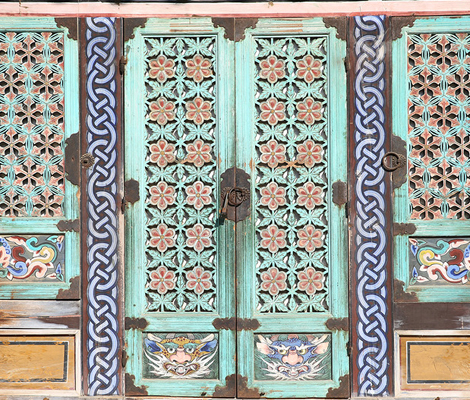 The present building was restored using the original cornerstones dating from the Shil-la period in 1973 according to architectural designs dating from the later Joseon Dynasty. 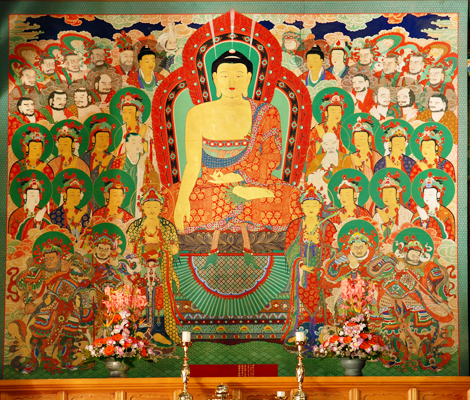 Anyang gate leads to the utmost bliss where Amitabha Buddha is. Yeonhwagyo and Chilbogyo Bridges(National treasure no. 22) are under the gate. The name 'Anyang' means ' the Utmost Bliss '. The One Pillar Gate, or the Dharma-gate of Non-duality: This is symbolic of the journey towards the one mind or the first step towards the Buddha Land. Whosoever passes through this gate is entering the sacred precinct of the Buddha. One should empty one's mind before entering the gate. The middle gate leading to the Daeungjeon where the Buddha is located. When Cheongungyo and Baegungyo Bridges(National treasure no. 23) come up, the kingdom of Buddha unfolds from this gate. Jahamoon means the gate surrouned by a purple fog from Buddha's body. Jwakyongroo (gong Pavilion) : This is where the Mogeo is hung. 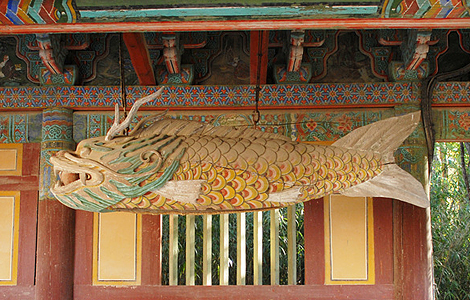 This carp-shaped wooden gong is hit to comfort the dead fishes in the hell. Originally, it was hung in front of the storage room or in the dining room and used to call monks. Later it was used during the recitation of sutras. Now it is used as a dharma tool which delivers the Buddha Dharma to all beings in the water. Since fish always keep their eyes open, the wooden fish symbolically encourages the practitioners to stay awake in meditation. Mokeo,a wooden fish-shaped drum: It is believed that all fish that hear the sound of the drum will be delivered. Monks strike the sides of the hollow center with two sticks. 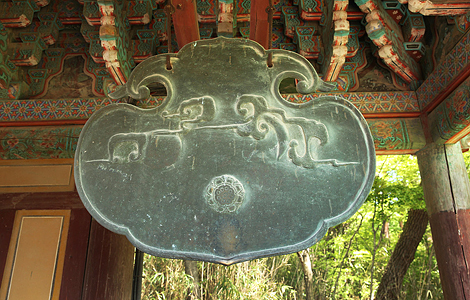 Unpan, Cloud-shaped gong: A cloud-shaped bronze plate with the letter of a six-syllable mantra or a design of dragon on its body. It is usually struck to signal meal time, but it is also believed that the sound of this brass will awaken and save the birds in the air. 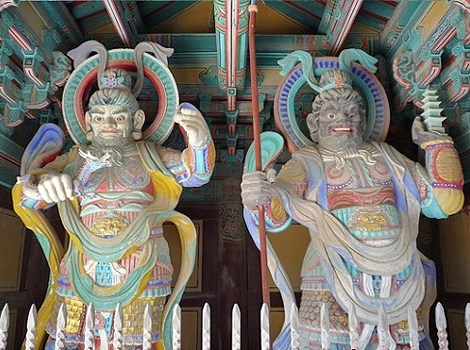 The gate of the four heavenly guardians, who protect the temple and the Buddha-dharma. 1) King Virudhaka, the guardian in the south in the form of a blue dragon. 2) King Dhrtarastra, the fearful aspect of the guardian in the east in white with a sword in his hand. 3) King Vaisravana, the guardian in the north in black with a lute in his hand. 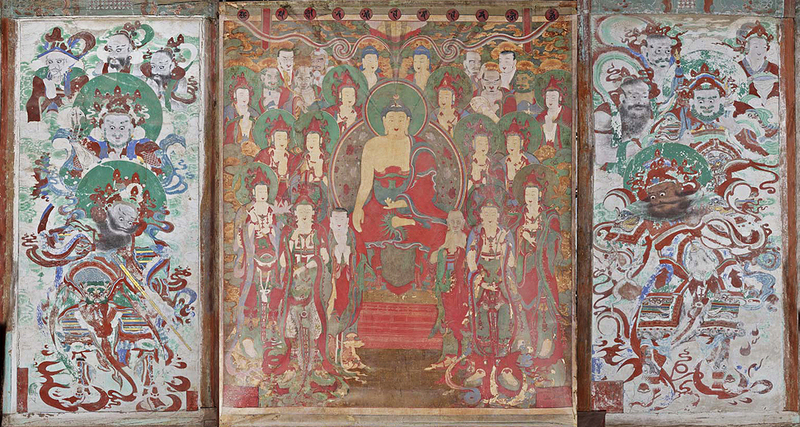 4) King Virupaksa, the guardian in the west in red with a stupa in his hand. Cf. 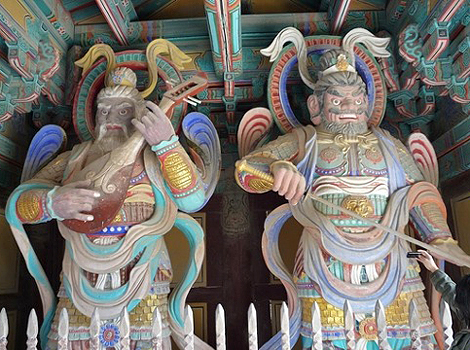 (Sacheonwangmun) The gate of the four heavenly guardians.